For this Ikat print I’ve used OPI’s The IT Color and Call me Gwen-ever for the base. The white is called Alpine Snow and the dark maroon cream is called Skyfall, both by OPI. I’ve created the black with black acrylic paint. I kinda like how messy this looks. What do you think of this design? This entry was posted in Nail Art and tagged ikat. 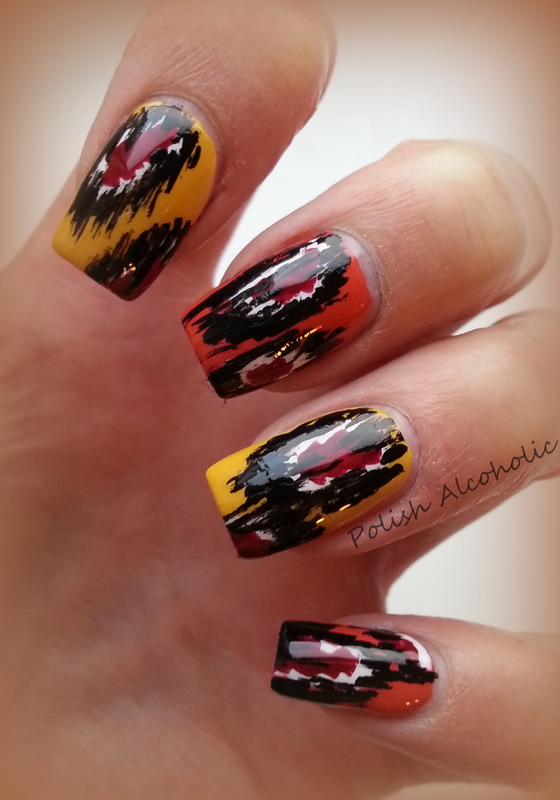 ikat nails, nail art, wordpressbeauty by Polish Alcoholic. Bookmark the permalink. Reblogged this on Brown Girl Certified Blog. Good job! I have tried this twice now and came out with total messes that had to come off right after I finishes – so yours looks amazing!